The 100W challenge provides an opportunity for designers to unleash their creativity. LAPD invented the 100w challenge alongside the IALD. This event became a success within the lighting industry, involving 10 leading lighting design consultancies. The event ran in 2013 and 2014. During an awards dinner one winter, Simon Thorp from LAPD and Emma Cogswell from the IALD discussed the possibility of an industry wide event that would promote the lighting design profession. Intended for the wider public and not just within the lighting industry, it had to raise awareness of the ability of lighting designers to use light creatively but also to substantially reduce energy. To achieve all of this it seemed appropriate to use a domestic setting. People are familiar with the lighting in their homes from a functional, decorative and monetary perspective. Therefore, using a house for the event would create a familiar reference point to make comparisons with. Pendant lights, floor lamps and table lamps are a common way of lighting rooms within the home and most people are familiar with relating the wattage of a lamp to the brightness of a room. To limit the entire wattage of the house to 100w felt like a realistic but very demanding challenge. The brief started to take shape. A significant criteria was that each room should be suitable for a domestic function. Therefore, its ability to support each room’s function would reveal the success of a design. To establish levels of interest, the IALD approached suitable lighting design consultancies. The year before his conversation with Emma, Simon attended a Xicato Secret Dining experience. 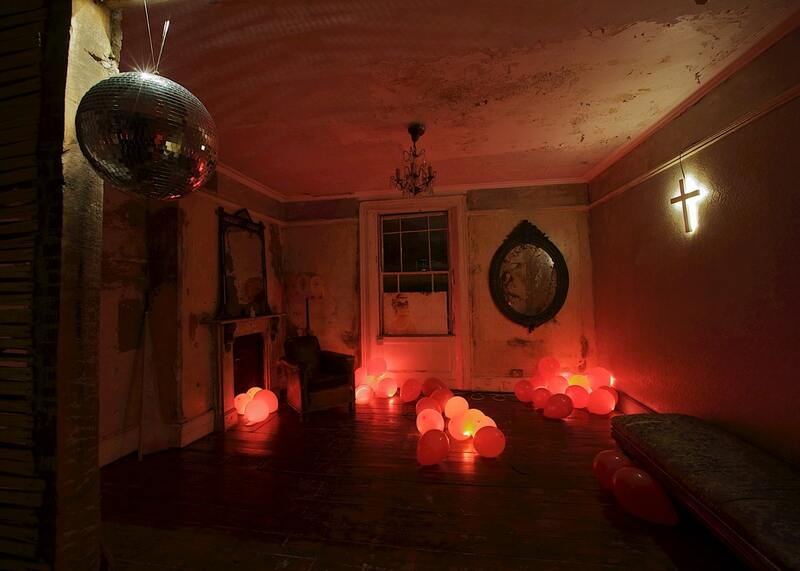 That took place in a house in East London used for filming and photoshoots. Called The House Next Door, it was perfect for the needs of this event. The house oozed character from top to bottom. It had nooks and crannies, ledges, alcove and so plenty of opportunities to integrate lighting. There was an array of different textures throughout each room on walls, ceilings and floors. The brief designated the function of the back room on the ground floor as the dining room. Its working fireplace allowed for the use of a limited number of tea lights, if they suited the scheme. With the venue chosen, we needed suitable lighting products and equipment. The most suitable product type to use for the event was LED tape. This created a level playing field for all of the consultancies involved. They would all receive a fixed length of tape with a fixed output. This way, it was possible to monitor and compare the exact wattages used. Variation in design solutions was purely down to the designers themselves. Considered a first choice from the outset, LEDLinear’s response to joining the event was an instant yes. We chose LEDlinear because they had the widest variety of lenses, diffusers and profiles at the time. Because of this range, the designers’ tool box included diffused ambient lighting along with lensed and point source options. The total length of tape provided was 17metres and the minimum step length was 62mm. Each consultancy would receive a sample pack of lights weeks before the event to experiment with prior to deciding on a final scheme. LEDlinear recommended EldoLED as the LED driver company. They were equally keen to participate and sponsor the event. Their drivers allowed the use of dynamic lighting if required. The sponsors provided money to run the event in addition to their products. This enabled the event to have food, a photographer, venue hire and beer. The event ran over a week and had one lighting design consultancy in on each day. Being responsible for the conception of the challenge, it was appropriate for LAPD to go in first to discover and deal with any teething issues or oversights. This allowed the following 4 days to run smoothly. The other 4 lighting design consultancies were KSLD, Lighting Design International, Speirs and Major and Arup Lighting. We wanted to ensure there was no duplication of lighting schemes. So we requested a one-page mood or concept board from each team along with text describing the design intent. As we evaluated each of these mood boards our confidence in the event grew, due to the diversity of concepts put forward. Simon, Emma and Stuart Knox from LEDLinear assessed each scheme. Merit was awarded based on the ability of the lighting in each room to carry out the designated function of that room. While light meters were used, they were not really necessary to establish if the room functions were possible. Unfortunately, some teams spent less time on lighting the rooms to a functional level, focussing instead on the creative side of the brief. Ultimately to demonstrate clearly to the public that the concept was possible the resulting schemes needed to be obviously illuminated to allow household functions to take place. LAPD’s concept was based around the board game Cluedo. The house was a suitable murder mystery environment and importantly the structure of the game gave a clear choice of different room functions. 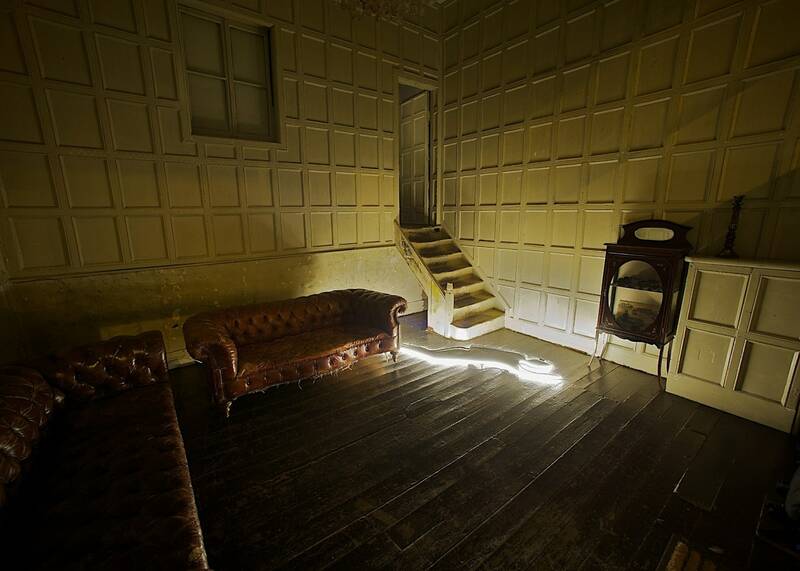 The medium of light revealed the spaces, depicted the characters and helped to identify the culprit, the weapon used and the room where the murder had occurred. We had several meetings in-house at LAPD to design the scheme for each room. The kit provided by LEDLinear was also used to test different ideas and importantly to budget for how much light would be used in each room to meet the 100 circuit watt target. After negotiations with the venue it was decided that teams could enter at 2:30 pm and had until 8 pm to finish their installation. At 8 pm the photographer began taking pictures of the scheme. Clearing up began after the teams refuelled with food and drink. The teams had to be off site by 9pm leaving it ready for the next day. During set up on site it was important that none of the installations required permanent fixings or damage to the property. Teams used adhesives, pins, cable ties and even blue tack. Teams could use props, as long as they emitted no light themselves. LEDLinear had plenty of staff on site in the make up room to respond to the designers’ needs for LED strip of a given length, cutting and wiring the necessary configurations. They also created strips mounted to profiles or accompanied with a diffuser or a lens. When you enter the ‘Cluedo Murder Mystery House’ through the front door the first room you enter is the Entrance Hall. This was intentionally one of the brightest spaces in the scheme and it immediately signified what had occurred to start the story. 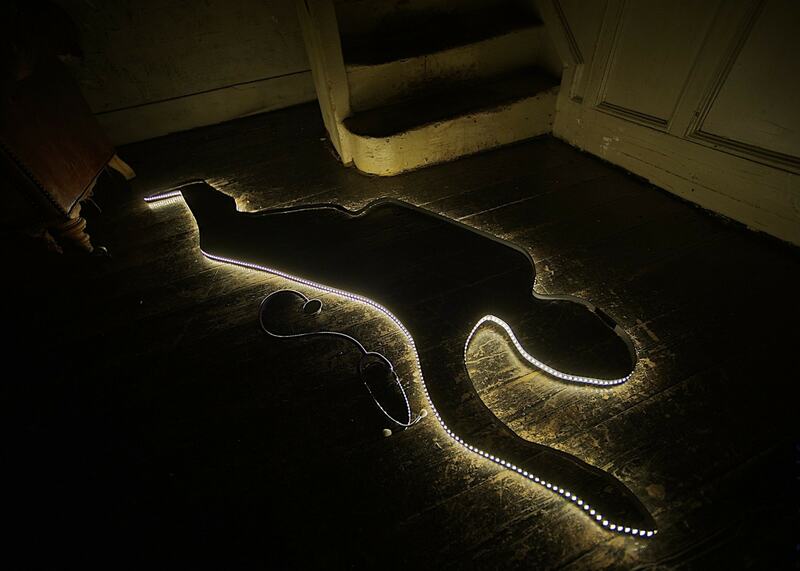 LED strip, in lieu of a chalk outline, depicted Dr Black lying dead on the floor. We spent some time determining how much of the 17 metre quota to use in this room. In the end we used 7 metres in this room alone, assuming only one arm splayed out beside him. The LEDs faced to the outside of the figure to light the vertical surfaces of the room most effectively and therefore raise the perceived brightness of that space. Doing this also reduced direct view glare and allowed the figure to became a black body, further helping to identify the victim as Dr Black. A stethoscope placed beside him assured people that it was indeed Dr Black. Beyond the entrance hall and up a short flight of stairs was the dining room. Tea lights in the fireplace lit the room to a low level. LAPD increased light levels by concealing lighting within one of the murder weapons, the candle stick; and within some of the wall in the process. We boosted the perceived light level by illuminating one of the wood-panelled walls. 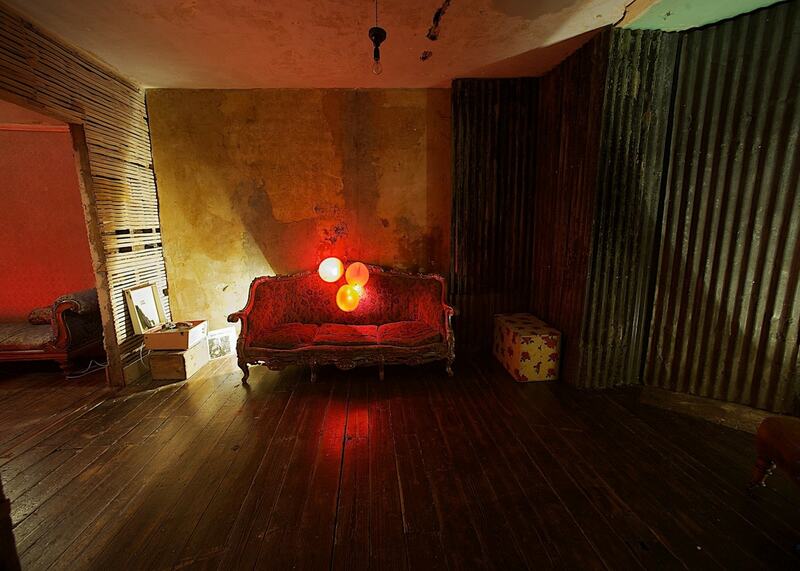 This light added richness to the scene by enhancing the texture of the wall. 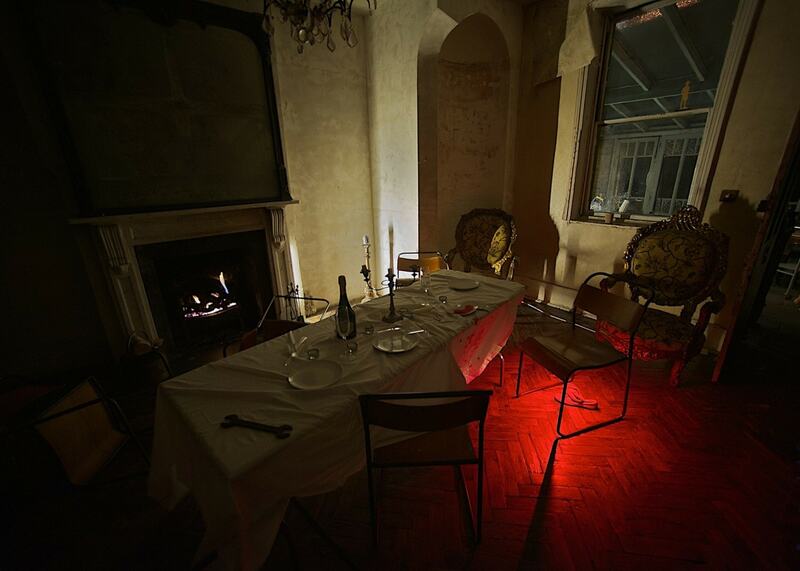 To assist in our story-telling, we used coloured light sparingly in the dining room. Red light hidden below a dining chair identified the culprit by illuminating a pair of scarlet shoes belonging to Miss Scarlet. But to complete the game and tell the whole story LAPD needed to identify where it happened and how. The main staircase lead up to the next room in the house. We lit the stairs well to make it safe and easy to navigate between rooms on the rickety wooden staircases. At the top of the stairs was The Ballroom. The red glow to the room indicated this is where the murder had occurred. A backlit crucifix represented Reverend Green, while additional props conveyed the idea that this was the ballroom. A mirror ball, lit using some lensed LEDs, created sparkle and motion. Two rooms made into one space created a size of room more appropriate to a ballroom. Additional props like the record player and the gun resting on it, illuminated with warm white light, increased visual clarity in a room mainly lit in red light. Balloons, used as colour filters and diffusers, became the predominant light source. They immediately created the party feel to the space that we wanted. Several popped during set-up – it is quite a challenge to get LED strip into a balloon and blow it up. The last two rooms on the floor above, as well as the murder weapon, still had to be identified. We transformed one room into The Library; by placing strips of LED into notebooks and opening them to emit the light. Because of the amount of light, an area of the room functioned as a space for reading. Professor Plum was represented by illuminating a bowl of plums and also the dagger – another weapon that was not used. The final room was the study. Illuminating the desk locally ensured that there was plenty of light to be able to write and read letters. 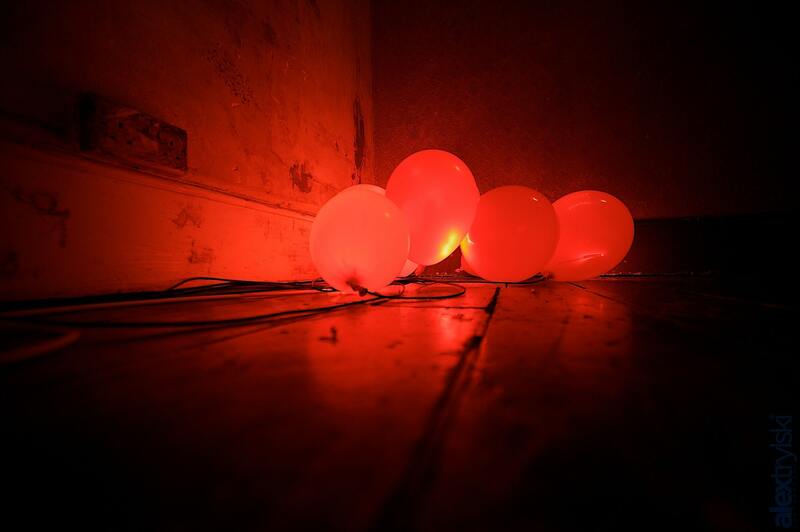 The final clue was also provided using red light; the lead piping. It was backlit using LED strip in a deep red colour. So the story was told using light; it was Miss Scarlet who murdered Dr Black, in the ballroom, with the lead piping. Dr Black tried to stumble his way out of the house and finally collapsed in the entrance hall. 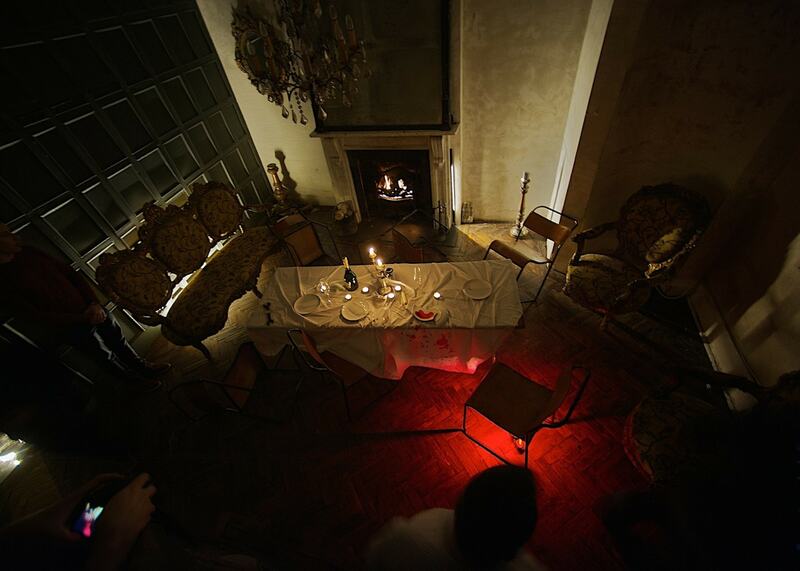 In the end, we used 86w of our total allowance and all of the rooms had sufficient light for their chosen functions. The four remaining consultancies took their turn over the next four days. The following year five different lighting design consultancies took part. Many of the mainstream UK lighting magazines published the event and it ended up being a success within the lighting industry. The teams involved responded very positively to the event and were disappointed to discover the event would not be done by the same teams the following year. As and when the event progresses the message must go wider – outside of the lighting industry. Energy bodies such as the BRE, energy saving trust and the carbon trust could all help to widen the awareness of the lighting profession and widen the awareness of the flexibility of light to enhance space and reduce energy well below current expectations.